Pauline Thelma Morey Vineyard passed away after a long battle from the effects of a massive stroke twelve years ago. 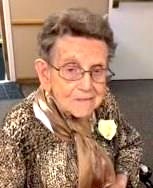 She was with her loving family at her home, Vintage Park Assisted Living Facility in Gardner, Kansas. She was born in Nevada, Missouri, on January 9, 1925. She met Jerry Robert Vineyard there and married on August 28, 1943. He proceded her in death as well as her parents, Paul and Dovie Morey, and sister, Viola & Harley Errett and 1 nephew. She is survived by her older sister, Wilda & J D Richards of Lubbock, TX, Sister-in-law, Nancy Vineyard of Tacoma, WA, 2 nieces & 4 nephews, Pauline’s children are: Shirley & Jim Dorsey of Bartlett, Tennessee, Connie & Neal Weltha of Tonganoxie, Kansas and Paula & Steve Mallon of Olathe, Kansas. Pauline had five grandchildren and ten great-grandchildren. Pauline and Jerry had relocated to the Olathe, Kansas area in 1989 from Emporia, Kansas, where she had served as Administrative Assistant for the Emporia Recreation Commission for 26 years. She was an active member of the Congregational Church and supported many community services in Emporia. At the time of her stroke in 2005 she attended Grace United Methodist Church in Olathe and was a volunteer in the emergency room of Olathe Medical Center. `The family would like to express their gratitude for the loving care she has received from the staff of Vintage Park of Gardner and Vista Hospice. Memorial Service will be held at 11:00 a.m. Saturday, October 1, 2016 at the McGilley and Frye Funeral Home, 105 East Loula St., Olathe, Kansas. Visitation will be 10:00-11:00a.m. Saturday, October 1st at the funeral home prior to the service. Graveside service will be held in Newton Burial Park, 311 W. Highland Ave., Nevada, Missouri at 3:00 p.m. In lieu of flowers memorial contributions may be made to: Vintage Park of Gardner 869 Juniper Terrace Gardner, Kansas 66030 or Vista Hospice 13316 West 98th Street Lenexa, Kansas 66215.